I have a friend who is an insatiable sweets addict. If he gets a whiff that anyone he knows is baking, he’s all over it. He’s a bit of a cookie monster and he doesn’t mind one bit. He’s also a bit of a pain in that he’s a purist when it comes to chocolate chip cookies. 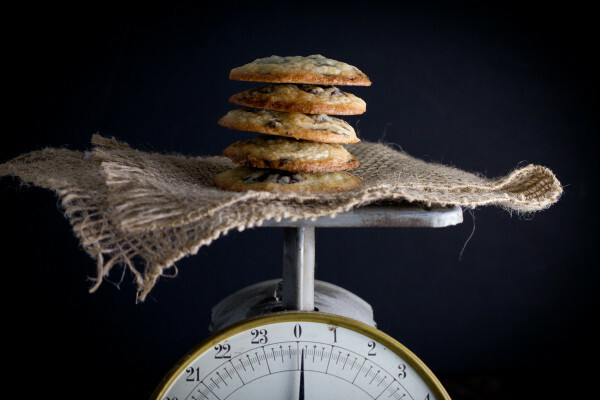 He turns his nose up at my variations like Coconut Chocolate Chip Cookies, insisting that all those extras have no place in a cookie–especially nuts. His loss. I can’t remember ever making chocolate chip cookies that weren’t packed full of extras, whether they be pecans, walnuts, coconut, toffee chips, etc. 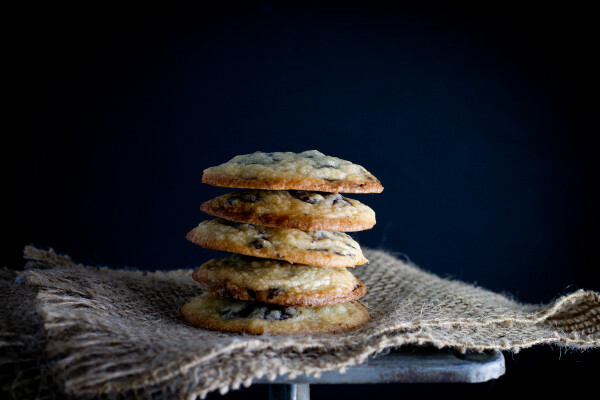 Chocolate chip cookies are the perfect vehicle for a gathering of all your favorites contained in one bite-sized bit of goodness. It seems a waste to pass on that opportunity. Still, I started to doubt myself. Was I wrong? Was I the one who was missing out on something by soiling the purity of this perennial favorite? I had to find out. If you’re going to bypass the mix-ins, you need to make your chocolate count. It has to be the star of the show! In this case, I went with semi-sweet chocolate chunks that I found at Trader Joe’s. You can also chop up a gourmet chocolate bar or bittersweet baking chocolate for a similar effect. It’s all good. What’s the verdict? Not bad. It’ll take some getting used to–where are my nuts?? ?–but I could see myself making them again. Which would probably make my friend quite happy, if I choose to share them. He’s always looking for a good cookie. Preheat oven to 375 degrees Fahrenheit. Line 2 cookie sheets with parchment paper and set aside. In the bowl of a stand mixer fitted with the paddle attachment beat butter and coconut oil until creamy. Add sugars, beating until light and fluffy, 3-4 minutes. Beat in eggs, one at a time, waiting for the first to be fully incorporated before adding the next. Gradually add the flour mixture, beating until just incorporated. Using a #60 cookie scoop (2-tsp), portion out dough onto the prepared baking sheets, leaving 2 inches between each dough ball. Bake 9-11 minutes, or until the edges have browned. Leave on cookie sheet for 2 minutes, then remove to wire racks to finish cooling. So…I’ll take 3 dozen please…need my address?? Yummmm!! Love the scale shot too! 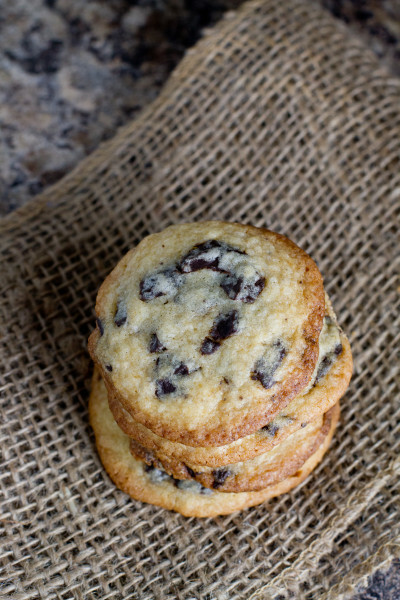 I’m so happy to get a chocolate chip (or chunk) recipe from you!!! You’re such an amazing baker…and me…not so much! I foresee my family thanking you profusely! You are such a sweetie! Hope you like them! I may be a weirdo but I hate nuts in my cookies! These look amazing! Mmmm! These look delicious! How would you spice them up (if at all) for Valentine’s Day? Being a purist recipe, I’m not sure I’d change anything. But if you’re looking for some pizzazz, there are always Valentine’s Day-themed sprinkles and bits that you could throw in the batter for a little color. Holy eff. 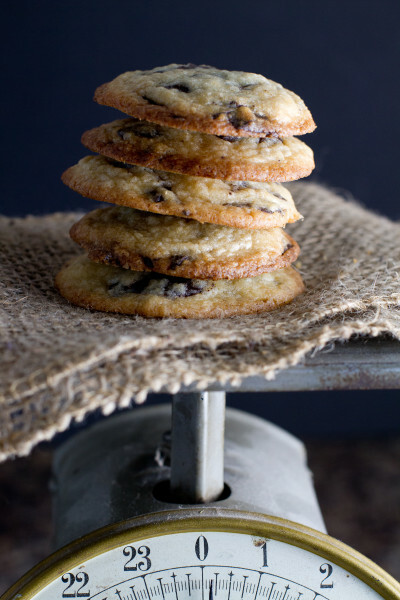 From the looks of it I do believe you’ve made the PERFECT choc chip cookie.